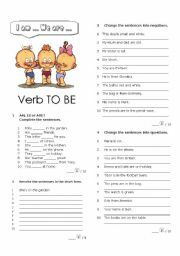 � Write the verbs�in�Present Simple. My mother and I �jam and toast�. We �milk every morning. My cousin �English very well. Dana and her friends �the homework together. She �in the afternoon because she is very tired. My father �us�a story every evening. I �a letter to my� new friend twice a month. At�7 o'clock in the morning we �to the market . My sister and I �to buy this beautiful house . My grandfather �movies on TV every Tuesday. The little baby �a lot at� night. What is correct ?�doesn't or don't ? I doesn't / don't like banana ice cream. She� doesn't / don't speak�Japanese well. Mr. Sharon doesn't / don't play the guitar. My father doesn't / don't� like classical music . We doesn't / don't� want to buy a new car this year. They doesn't / don't live in Madrid. They live in Peru. Tomatoes doesn't / don't grow on trees. He likes swimming, he doesn't / don't like windsurfing. Danna is my new girl friend. Her mother doesn't / don't like me. I and Tom doesn't / don't keep pets at home. The snakes doesn't / don't have legs. � Questions/�Write Do or Does. � DoesDo �you cook in your family? � DoDoes �she speak Italian? � DoDoes �he go to the cinema on Saturdays? � DoesDo �your little brother�like meat? � DoDoes �they write the homework alone? � DoDoes �you walk in this park in the evening? � DoDoes �Anna sing in French? � DoDoes �Tommy love swimming? � DoDoes �this girl�like running? � DoDoes �Mark and Sandra read books? �We use Present Simple to describe our daily activities.